Staff inspect mechanical household sewage treatment systems yearly and non-mechanical systems every five years. Water quality technicians determine system location, check for proper system maintenance and operation, and provide helpful information to system owners. Staff also help home buyers avoid unforeseen repair or replacement costs by offering a voluntary septic system inspection service prior to the purchase of a home. Hamilton County Public Health began an operational permit program of household sewage treatment systems (septic systems) in 1994. The permit program began with the inspection of aerobic treatment units and was expanded in 1996 to include all household sewage treatment systems located within the jurisdiction of the Health District (mechanical and non-mechanical). 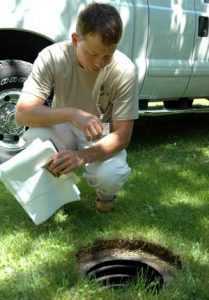 Each year, Health District sanitarians inspect approximately 14,000 new and existing septic systems in Hamilton County. Anyone is now able to view the results of sewage treatment system (STS) inspections performed by the Health District (Hamilton County, excluding the cities of Cincinnati, Norwood, and Springdale). Please note that inspection results are updated weekly and show the most current inspection at that time of the last update. To view the inspection results, use the map below to search for a property address. Once a property is displayed, click on the red, green, black or yellow “points” to view the information about the sewage treatment system. Please view in large map format by clicking here. Click here to view the STS Map Legend. It is important to understand, that inspection information provided here shows only the conditions of the sewage treatment system at the time of the inspection. Although a single inspection can reveal a system that has passed inspection, the system’s inspection history (number of approvals and disapprovals) can give a more accurate picture of a sewage treatment systems performance over time. DISCLAIMER: DO NOT RELY UPON THIS SEWAGE TREATMENT SYSTEM INSPECTION REPORT AND/OR OPERATION PERMIT FOR ANY SALES OR FINANCIAL TRANSACTIONS. This inspection report is based on current sewage treatment system conditions at the time of inspection. An approved inspection report and/or operation permit does not guarantee that the sewage treatment system meets today’s water quality effluent standards, has an approved discharge location, that it will continue to operate in a satifactory manner, or that changes to the home, structure or property will allow this system to be permitted in the future. All household sewage treatment systems with mechanical components (aeration) are inspected yearly; systems without mechanical components (non-mechanical) are inspected once every fifty-eight (58) months. During the inspection, staff determine system location, check for proper system maintenance and operation, and provide helpful information to system owners. Health District staff will either knock on your door or ring your doorbell prior to inspecting your system. If you do not respond, a green door hanger will be placed on your door. This door hanger identifies the reason for the inspection, date and time of inspection, and the name and phone number of the inspector. Staff will then proceed with inspecting your household sewage treatment system. Staff typically wear polo shirts or other shirts or jackets which are marked with the Health District’s logo. In addition, all staff carry picture identification badges. Once the inspection is finished and paper work is completed, a copy of the inspection report and invoice will be mailed to you. You will be asked to pay your fee within 30 days, at which time your permit will be issued if your system has been approved. For more information call (513) 946-7863. Go here to learn about Real Estate Transfer Inspections. To request an inspection, click here, or call Water Quality staff at 513-946-7966.